The end of this article was updated on Feb 14th, 2019 after the deal was announced as completed. The M&A frenzy continues. As was first reported on Christmas eve, Ant Financial was rumored to be looking to purchase WorldFirst for c.£550m (US$700m). While there have been no official announcements, we’ve spoken to people on both sides of the proposed deal that appears to be moving forward. In 2014, Ant Financial was spun out of Alibaba, the giant Chinese ecommerce company. In June 2018, Ant raised $14bn as the largest ever fundraising by a private company. Estimates of the value of Ant Financial are hard to come by but previous numbers have come in c.$150bn. Ant originally tried to buy MoneyGram back in 2017. That was a very protracted process including a battle with Euronet, the owner of MoneyGram’s direct competitor Ria. The deal was eventually kiboshed by the Committee on Foreign Investment in the United States (CFUIS) who would not approve the purchase of a US financial services company by Ant Financial, a Chinese owned company. You can see our previous in depth coverage here. WorldFirst’s business has changed the over the last six years. It has pushed very heavily and effectively into the online seller space, especially in China and moved away from some of the B2B payments products such as currency options (which used to account for c.10% of its revenue). 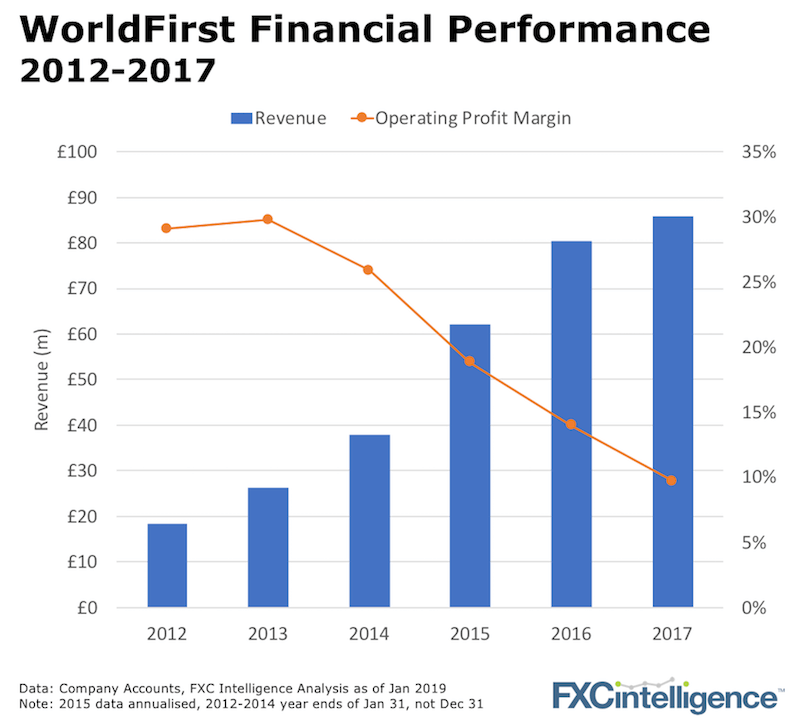 The chart above illustrates the changing nature of WorldFirst’s business as it has moved from higher margin segments such as currency options to the lower margin and now highly competitive online-seller space. 1. Mainstream cross-border payments for both businesses and individuals outside of Asia with WorldFirst holding key licenses across Europe, Australia and in particular across the whole of the US. 2. Access to the tens of thousands of Amazon (and other online marketplace) customers who use WorldFirst to process their cross-border payments. Ant Financial’s acquisition of MoneyGram was ultimately blocked by the Committee on Foreign Investment in the United States. WorldFirst has a small but not insubstantial presence in the US market and a full set of state licenses. It’s US presence will surely have to be addressed with any number of ring-fenced solutions possible. We also assume the deal has to be formally blessed by a variety of regulators around the world too. Second, anyone operating in the online marketplace segment has to go to sleep at night knowing that any day, Amazon could choose to completely change the way it manages cross-border payments. To de-risk this, Ant will know it will gain value from access to WorldFirst’s clients due to all the additional services it could offer them. What would Ant Financials other options be Ant Financial is a giant company with several strategic goals. The fact that it has switched from MoneyGram, a US-based cash focused remittance player, to WorldFirst says a lot. Additionally, it is not clear there is a better fit than WorldFirst given the China market overlap. B2C players (TransferWise, Revolut, N26, Monzo) are raising vast amounts of their own money and making their own way, likely to IPO. B2B players, who rarely have the same growth opportunities as consumer focused businesses, are being bought by strategics who can slot them into their overall offering (e.g. this potential deal or Visa & Earthport). It has been confirmed that Ant Financial has bought WorldFirst. The wrinkle, which has now been widely reported, was having to close their US operations but that clearly helped get the deal across the line.